The Loaded Gear AX-400 hard rifle case is designed to carry up-to two 50 inch long rifles or shotguns in its two separate storage compartments. This protective hard travel container features two crushproof handles. With eight key latch locks and four padlock adaptable fittings, this case offers above standard security protection. The rigid ABS and black aluminum frame offers added reinforcement to the exterior of this protective rifle case. 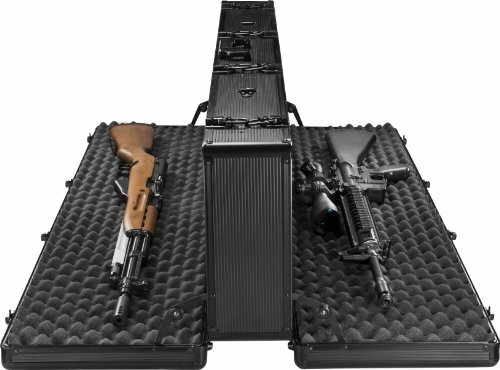 The Loaded Gear AX-400 rifle case includes four layers of removable egg crate foam, two in each compartment. The interior of the case is also lined with shock absorbing foam liner. Built in to the rifle case are interior locking hinges to ensure that the case stays open for easier access. Included Accessories: Shoulder Strap Loaded Gear. AX-400 Rifle Case Key Features: Two carrying handles Eight locking latches Interior locking hinges Four layers of egg crate foam padding Solid ABS Exterior Dimensions: 53 Inches; x 9 Inches x 13.5 Inch Weight (lbs. ): 22 lbs. Dimensions: 53 Inches; x 9 Inches; x 13.5 Inches Weight (lbs. ): 22 lbs.Kindly refer the user manual attached below for troubleshooting steps and instructions.